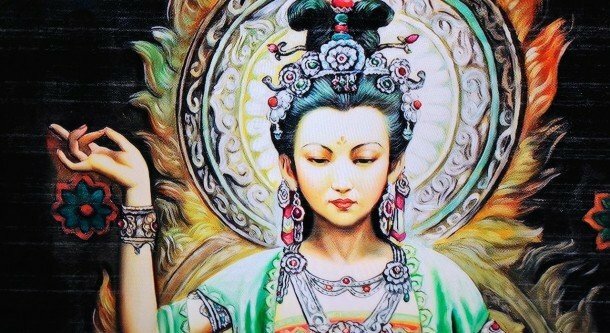 The Pilgrimage Mythology primarily talks about Kwan Yin, the goddess of mercy and compassion. In most of the myths, she is portrayed as a woman holding an infant, dressed in white, and sitting on a lotus. She was said to have been murdered by her own father. She arrived in hell reciting holy books and the king of hell was very angry with her. He sent her back to the world of the living where she gained spiritual insights from Buddha and later on was blessed with immortality. The temple of Kwan Yin, located at the summit of Wondrous Peak, has always attracted many pilgrims. The Pilgrimage Mythology also talks about how Buddhism was introduced and flourished in China. The mythology has it that The Monkey King converted to Buddhism but continued to use Taoist knowledge and skills to combat evil. A government official named Wu Ch’eng-en in his popular novel, Journey to the West, tells the myth about the Monkey King, Sun Wukong. Sun Wukong is the most famous monkey in China. He was said to have been born out of a stone egg that came from a magic rock on the Mountain of Fruit and Flowers. According to mythology, Sun used to be very naughty and eager to take over the world and it took Buddha a lot of effort to tame him. 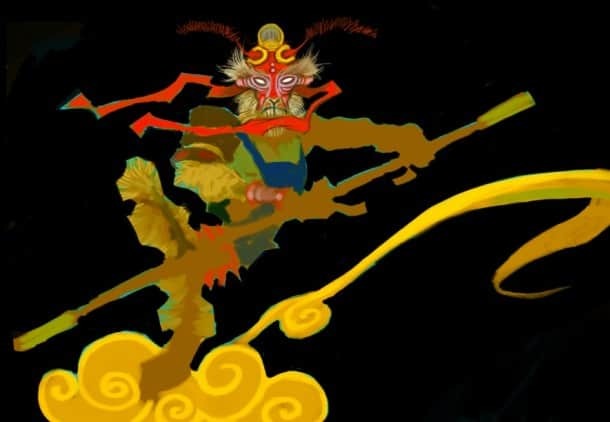 The Monkey King is characterized by his greedy, but joyful, curious, and extremely popular nature. Later in his life, he became a loyal companion to the monk Xuanzang on his adventurous journey from China to India and back again. The myth of the unicorn’s prophecy sprang up around the life of Confucius. This story introduces the unicorn, the chi-lin, which is considered a sacred animal to the Chinese. It bears little resemblance to the unicorn of European myths, and is a mixture of many creatures including the deer, ox, dragon, and horse. The chi-lin has been depicted in myths as a peaceful and timid animal who leaves the innocent alone, but if angered, will jab evil people with its horn. 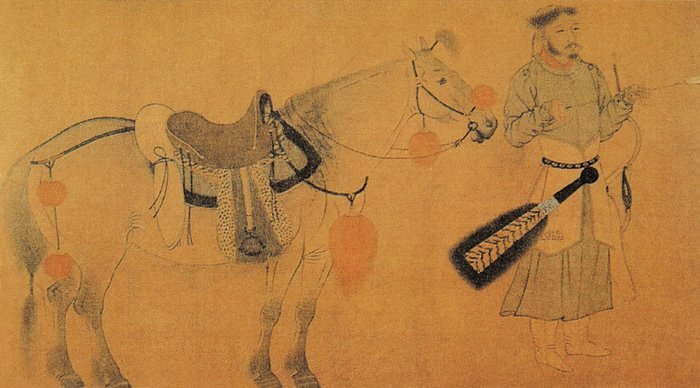 It is said that loyal soldiers embroidered the emblem of the chi-lin on their clothing to show how dutiful they were. During the 14th century, a real giraffe was sent to the imperial court and many observers claimed it was the reincarnation of the mythical chi-lin. Chang-O (or Chang’e), the Chinese goddess of the moon, is the subject of several legends in Chinese mythology. 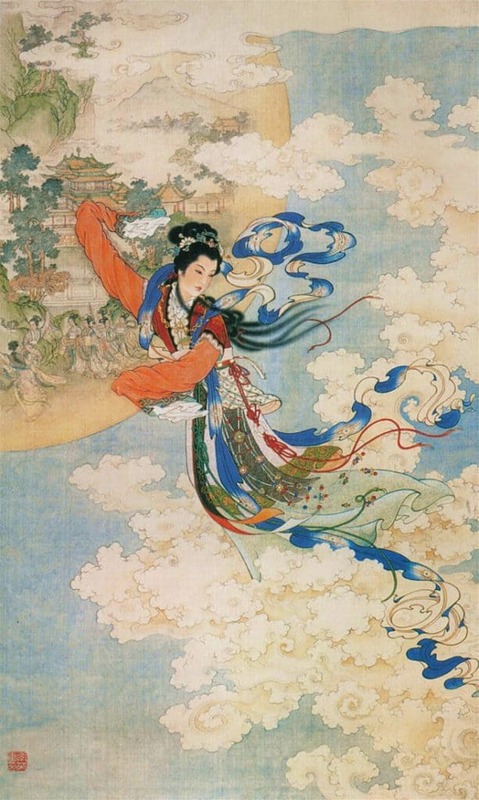 The moon goddess myth revolves around Hou Yi the archer, the elixir of life, a benevolent emperor, and the moon. This popular and interesting story about Chang-O takes you to the distant past where the 10 sons of the Jade Emperor were transformed into 10 suns. The 10 suns rose to heaven and scorched the earth, threatening mankind’s survival. The archer Yi shot down nine of these suns and left only one. Yi was then rewarded with the elixir of immortality. One day, when Yi was out hunting, his apprentice Feng Meng broke into his house and tried to get the elixir from Yi’s wife, Chang’e. But Chang’e refused to give the elixir to Feng Meng and drank it all herself. As she consumed it, she became weightless and flew upwards towards the heavens and stayed on the moon as a refugee. In many ancient Chinese mythologies, we can see gods helping the people. But the Grand Archer Yi is one of the few mortals who has helped the gods. He is characterized by his great skill at archery. 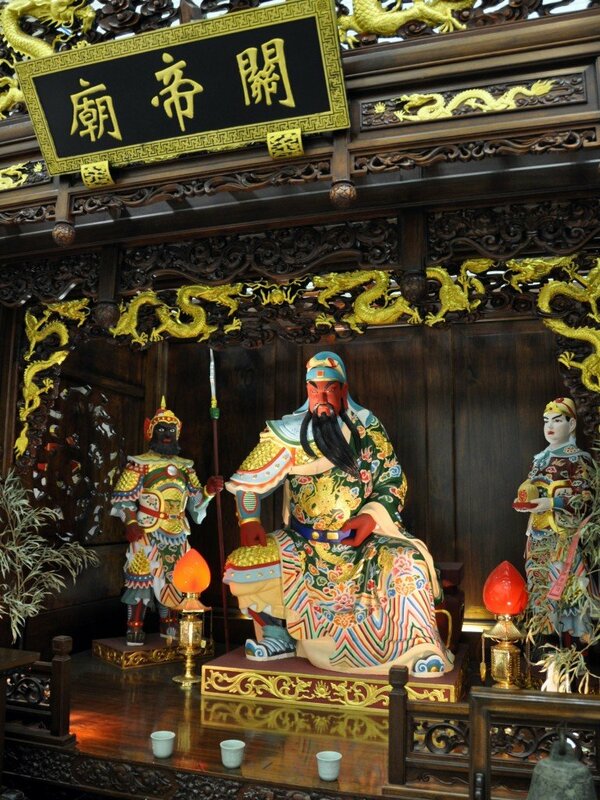 Hou Yi is believed to have lived between 2436 and 2255 BC. Myths about him are linked to the people of the southwestern part of China. Yi was one of the most famous archers of that time. It is believed that Yi saved the moon during an eclipse and rescued the country from a variety of outbreaks. Hou Yi is also said to have shot down nine of the 10 suns that were burning up the earth in prehistoric times. The myth about Yu the Great is based on Chinese legends dating from 2205 to 2197 BC. Like all demigods in ancient times, Yu the Great could change himself into different shapes whenever necessary. He could transform himself into a bear, a dragon, or a human. Yu is considered to be the first to pass his status as ruler on to his descendants, creating the first dynasty, the Xia dynasty. However, due to the lack of any archaeological evidence, the Xia dynasty still remains a myth. One of the many legends about Yu tells of his extraordinary birth where a man called Gun was told to control a great flood. He stole a piece of magic soil from heaven to dam the water. Furious with him, the Shangdi, or supreme deity, issued an order for his execution. After about three years, the miraculously preserved body of Gun was slit open and a son brought forth. He was Da Yu and the one who, after years of hard work, provided outlets to the sea through dredging, with the help of dragons, thus making the earth suitable for human habitation. Gong Gong (aka Kang Hui), a Chinese water god, is one of the frequently described characters in ancient Chinese mythology. He is depicted in stories as having red hair and the tail of a serpent. Gong Gong has been credited in various mythological texts as being responsible for destructive floods. He wrestled to gain control of the earth shortly after the creation of people. Before Gong, Zhurong, the fire god, ruled the world peacefully. But when Gong became the ruler, he wanted to expand his influence by increasing the amount of water in the universe, namely seven-tenths water to three-tenths dry land. So he sent heavy rains and came close to destroying the world in a fierce power struggle with Zhurong. To counteract the destructive forces of both Gong and Zhurong, Nuwa, the creator of people, appears in this myth. Gong is often seen as an ancient destroyer god and is blamed for many other cosmic catastrophes. By all accounts, Gong Gong ends up being killed or sent into exile. The most ancient myths involve the 10 legendary kings or gods who guided people through their prehistoric beginnings (around 3000 to 2197 BC). They were demigods (half god and half human), who lived among the people and taught them the rules of civilization. Fushi was the first ruler of this magical period. Many scholars believe that his story is based on an actual monarch who lived sometime between 2953 and 2736 BC. In all the many variations of these mythological stories, Fushi has been depicted as a beloved figure who taught survival skills to the early humans. He taught people how to use fire, how to cook, how to write, and many other skills like hunting, fishing, and fortune-telling. Some myths depict Fushi as having the body of a human while others depict him as having the head of a human and the body of a snake. In many stories, he is regarded as the husband of Nuwa and they are the creators of civilization. 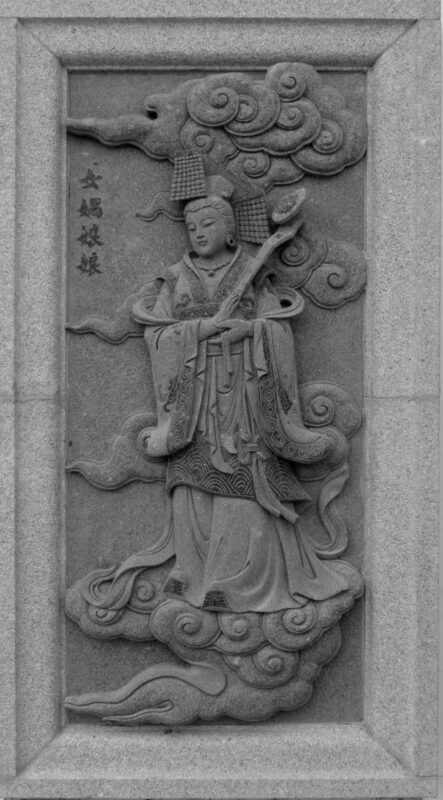 Nuwa (aka Nugua), the goddess of humankind, is one of the most popular characters in ancient Chinese mythology. 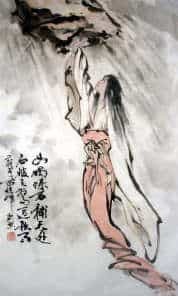 According to mythology, Nuwa created mankind and repaired the pillar of heaven and the broken corners of earth which Gong Gong had destroyed in a fit of anger. In Chinese mythology, Nugua is regarded as the patroness of matchmakers. As the wife of Fushi, she helped establish a model for marriage and regulated the conduct between the sexes. Nuwa is also said to have built a lovely palace that became the prototype for the later walled cities of China. The materials of the palace were said to have been prepared overnight by mountain spirits. The earliest Chinese mythologies contain many stories of the wondrous rulers of ancient times, but there are no creation stories. The story of Panku (aka Pangu) is probably the closest Chinese version of a creation myth. 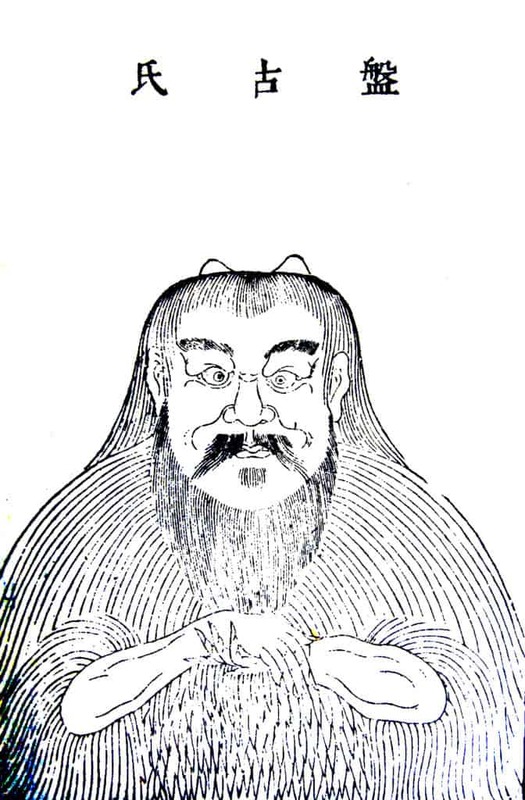 Pangu is the central figure in the Chinese Taoist legends of creation. Pangu, the first man, is said to have been created out of the cosmic egg and had two horns, two tusks, and a hairy body. According to the ancient myths, Pangu is said to have shaped the earth by chiseling out valleys and stacking up mountains. All this was accomplished using his knowledge of yin and yang, the inescapable principle of duality in all things. When we look at the history of ancient Chinese mythology, writings seem to have begun in the Wei and Jin dynasties (220 to 420 AD). Influenced by the ideas of alchemy and Taoist and Buddhist superstitions, various writers invented tales of gods and demons. When we read their stories, we see a great imagination and mastery of the written language. The practice of storytelling has continued through the generations. Like many other cultures, Chinese mythology is entwined with history. Most of these myths date back to ancient times, and some even predate the recorded history of mankind.